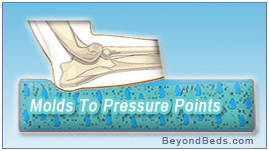 Canine Cooler's cool, pressure relieving cushion is the perfect treatment for pain, discomfort, swelling, and stress. Simply fill with tap water and the absorbent inner core creates a foam like, cushioned bed that is dry and soothing. Vet-recommended to treat dogs with skin conditions, allergies, autoimmune diseases, elbow and hip dysplasia, Cushing's disease, hemolytic anemia and other ailments. The Canine Cooler's specialized core provides buoyant, flotational comfort and relieves pressure points by molding to your dog's individual joints and body contours and equalizing his weight distribution. Traditional pet beds can harbor ticks and their eggs, fleas and bacteria, and mat down over time, but the Canine Cooler has built-in anti-mildew and mold agents in its core and a glove leather soft outer membrane (20 mil.) for superior comfort, maintenance and durability. Available in four sizes, the Canine Cooler's low profile is designed to give your dog easy up and down access and each bed comes with a one-year " paw puncture proof" warranty that covers seams, seals and unlikely paw punctures. Manufactured in an ISO9001 certified medical facility, the Canine Cooler is non-toxic, gel-free and completely safe for all dogs. 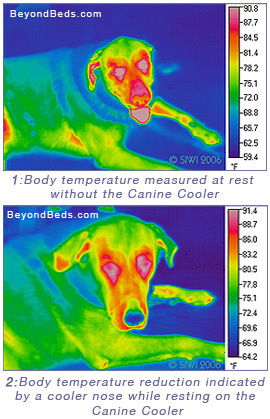 The Canine Cooler Thermoregulating Pet Bed is compressed during production and shipping for quality assurance. Set up is minimal: you simply fill the fluid foam cushion with water as instructed in an initial one-time activation process, and the SoothSoft Technology will maintain a refreshingly cool, dry and comfortable layer of support that your dog will benefit from and enjoy year-round. The Canine Cooler is maintenance-free and can be easily wiped clean. The optional Canine Cooler Cover is available in two different fabrics, cozy cover for the winter and a cooler cotton blend cover for the summer. Both covers slip over the bed like a fitted sheet with pockets that hug the four corners of the Canine Cooler without elastic. The cotton blend Cool Cover allows the cool comfort to flow through to your pet, while the Cozy Cover will provide the option of warmth for your pet on cold days. All covers for the Canine Cooler are machine washable and dryable. Medium 24" x 36" X 1.5 for dogs up to 70 lbs. Large 36" x 48" X 1.5 for dogs up to 150 lbs. Extra Large*** 36" x 72" X 1.5 for dogs over 150 lbs. ***The Canine Cooler extra large bed comes in two pieces, and is made up of a large and medium. The optional extra large cover is one piece that will cover both. One-year Limited Warranty. Made in the USA. 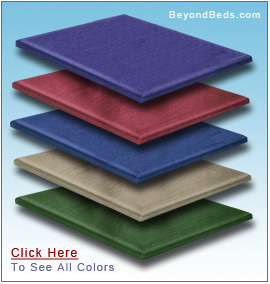 BeyondBeds.com is an Authorized Canine Cooler Retailer.